The Bistro de l’Hôtel, located in the elegant Hôtel de Beaune, is one of the places to see and be seen in Burgundy. Or so I am told. I try to visit Beaune before or after the crowds descend on the city, when things are less hectic. In the summer months the outside terrace is a great spot to relax and enjoy a comfortable dinner. Proprietor Johan Björklund is meticulous in his attention to every detail. The wine list is extensive, but the markups are generous for most of the wines, which is to say there aren't a ton of bargains to be found. Still, the sheer breadth of the selection compensates to some degree. As much as I enjoy tasting wine for a living, it’s much more fun to drink for pleasure, which is what this evening was all about. Yes, I know, Roumier’s 2010 Chambolle-Musingy Les Cras needs quite a bit more bottle age, but how could I resist ordering it? I couldn’t, and it was fabulous. No regrets. Sure, the 2010 will be even better in another few years, but it was pretty terrific on this evening. 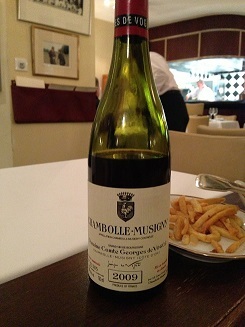 De Vogüé’s 2009 Chambolle-Musigny was even better, as the vintage is so well suited to near-term drinking, especially at the village level. 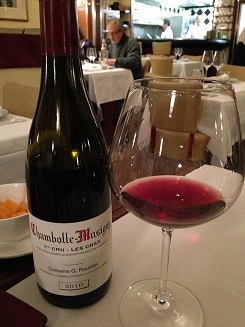 Totally seductive and engaging, the 2009 Chambolle was a thrill a minute to drink. There are times when wine is all about pure, unrestrained pleasure. This was one of those moments. What a fabulous bottle! 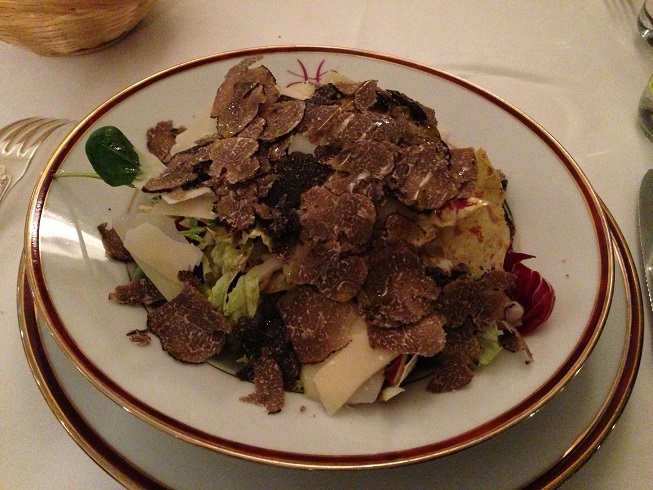 The generous addition of black truffles elevated what would have otherwise been a fairly standard green salad into the stratosphere. 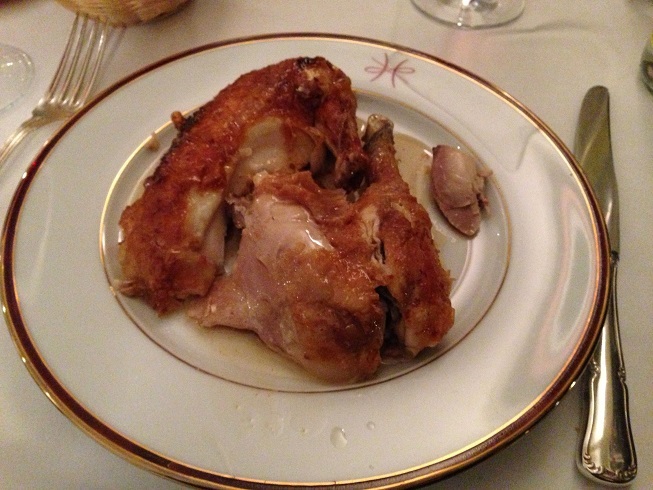 Our roasted Bresse chicken for two was also delicious. Main courses at the Bistro are served with fries, mashed potatoes and vegetables. For most people with a modest appetite, any one of the main courses is probably enough for dinner. On three visits last year everything was fabulous, except for the mashed potatoes, which I have never loved here. Readers visiting Beaune should make an effort to have at least one meal at the Bistro de l’Hôtel. I especially enjoy the Bistro during the summer because there aren't too many places in Beaune that deliver this level of cuisine and offer outside seating, something that I may value more than most people as I spend virtually every working hour in dark, cold cellars!